Pricing options can do as much as harm as good. 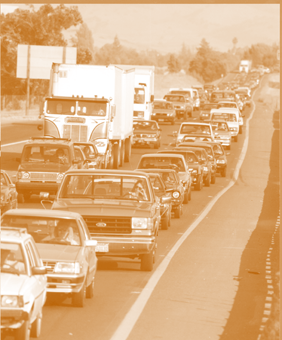 There is considerable interest these days in “getting the prices right” in transportation. Some environmentalists and supporters of mass transit believe the “right” prices will induce a lot of people to switch from cars to public transit. So they advocate a variety of additional charges on vehicles, fuel, road use, emissions, and so on. Some economists believe that the “right” prices will lead to an economically efficient and socially desirable use of transportation modes and fuels. Poor pricing schemes might do more harm than good. Pricing is difficult. It’s difficult to estimate the “right” prices, and harder still to implement “right” pricing. So-called “second-best” solutions can leave us worse off than we’d be with no change in our current pricing system at all. Pricing might surprise and disappoint some of its advocates. Contrary to expectations, the use of pricing to “level the playing field” will induce people to shift from transit to autos, because presently the field is tilted in favor of public transit. Those who feel it important to get people out of their cars should focus on improving the quality and reducing the cost of alternatives. Pricing might detract from important noneconomic concerns. In matters as complex and socially important as transportation, we care about a good deal more than economically efficient pricing, even broadly defined. We care about distributive fairness, equal opportunity, uncertainty and risk, ecological stability, future generations, quality of life, and so on. We should not subordinate or abandon these concerns to efficient pricing. In short, pricing might turn out to be counterproductive, ineffective, or irrelevant. If we are unable to estimate and implement transportation prices intelligently, without slighting efforts towards other important social objectives, then we should continue to rely on other tools. To deal with our multidimensional transportation problems, we can turn to performance standards, education, and market incentives designed with more than just economic efficiency in mind. In the following sections, I develop these cautions in more detail. I conclude with a discussion of alternatives to pricing. First, though, we must define “right prices” more carefully. What is a Right Price? The “right” transportation prices are generally considered to be efficient prices—the prices that arise in a properly functioning competitive market and result in an economically efficient use of transportation resources. Economists have developed an elaborate theory of efficient pricing. Generally, the efficient price of a resource is its marginal social cost (MSC). The social cost is the cost to society as a whole, which may or may not be the same as the “private” cost that an individual pays. The marginal cost is the cost of an incremental unit of a resource, as distinguished from the average cost of a great many units. Users of cars, buses, and trains already pay at least some of the social cost: they pay for vehicles, fuel, insurance, repairs, transit fare, and so on. If all these transportation markets were perfect, then users would face efficient prices. But, of course, we know that transportation markets are not perfect—that transportation gives rise to a variety of social costs that are not properly priced: air pollution, noise, congestion, some accident costs, costs related to importing oil, and some public infrastructure and service costs. These unpriced costs may be called, loosely, “externalities,” or, even more loosely, “subsidies.” These externalities, or subsidies, can create an unhappy situation in which the cost to individuals is less than, but the cost to society greater than, the benefit to society (see sidebar). Some individuals win, but society loses. We may say, then, that to “get the prices right,” we should make transportation users pay their external costs, or subsidies. To do this, we first must identify and estimate the subsidies. An individual is thinking about making a particular trip. Suppose the value of the trip to him is $10.75. If he goes by bus, the trip will cost him, by his own reckoning: $0.75 in fare, $8 in time, and $0.25 in potential accident costs—$9 total cost. From his point of view, cost is less than his valuation, so he takes the trip. But sup- pose further that the total social cost of the trip is $11, including $2 in subsidies. From society’s point of view, the $11 total social cost will exceed the benefit. If society decides to raise bus fares enough to “get the prices right,” the cost to the potential bus rider will exceed the benefit, and he won’t take the trip. Now, let’s introduce another mode of trans- portation. Suppose the person can also make the trip by car, for a cost of $7 in time, $0.50 in potential accident cost to himself, and $2 in fuel, operating, and depreciation costs—$9.50 total. Without MSC pricing, the traveler will choose the $9 bus trip over the $9.50 car trip. But suppose now that the external accident and pollution costs of the car trip are a relatively high $1. The total MSC of the car trip then is $10.50, which is less than the $11 MSC of the bus trip, and less than the benefit. Thus, if the traveler faces MSC prices for all modes, he will in this example switch from the bus to the car, and save society $0.50. 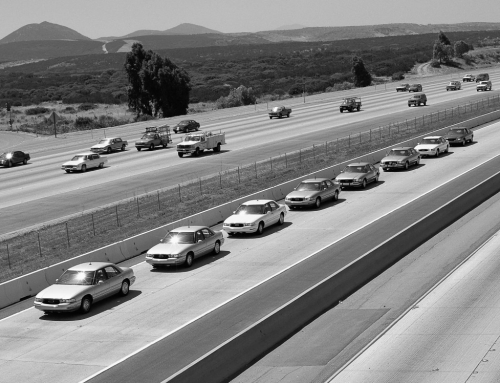 With good reason, many people are skeptical about estimated external costs of transportation. The best estimates of virtually all important external costs—air pollution, noise, accidents, congestion, and oil importing—vary by about an order of magnitude. (Estimates of infrastructure, service, capital, and operating subsidies are less uncertain.) Although further research and analysis can in principle reduce this uncertainty, they might not reduce it enough for us to pick the “right” price with confidence, especially for environmental externalities. Some issues, such as valuing mortality related to air pollution, may be intractable. Presently, researchers raise as many issues as they resolve. 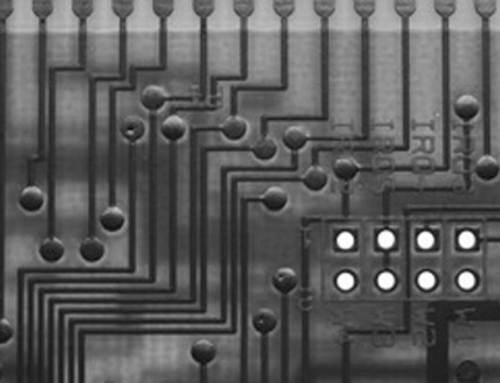 Even if we could estimate the right prices precisely, it would be difficult to install efficient pricing. Ideally, prices would not be fixed for a vehicle-mile of travel or gallon of fuel. Rather they would vary with the factors that determine the external costs being priced: ambient conditions, road attributes, traffic characteristics, exposed population, and so on. But it would be difficult to measure these in real time. 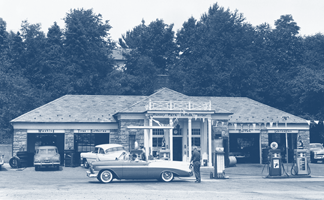 The gasoline tax does not match well with the external costs of gasoline. 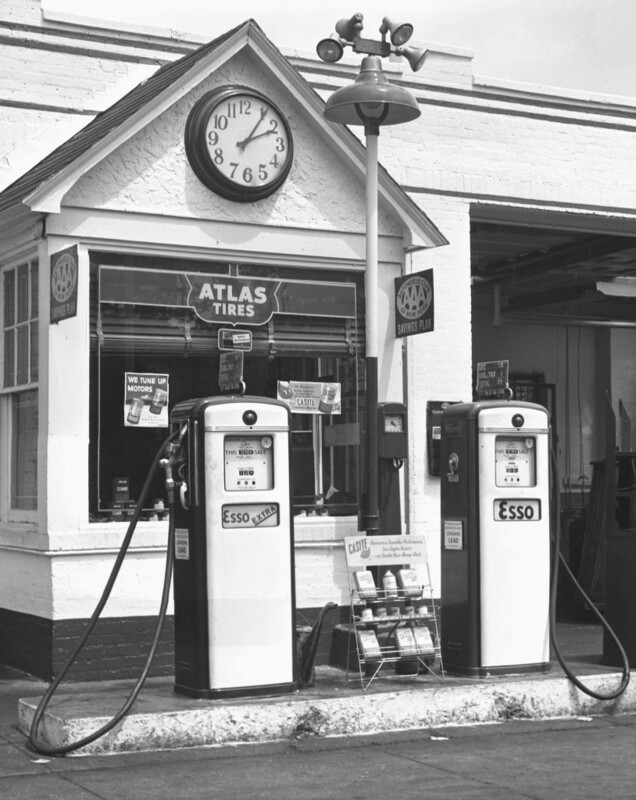 External costs vary from place to place and time to time, but within each state the gasoline tax does not. At some times or places, the tax might exceed the actual external cost, hence deterring people from making trips that are socially beneficial. At other times or places, the tax might not be high enough to deter socially harmful trips. These real-world shortcomings easily could erode most of the theoretical benefit of proper MSC pricing. And when the actual cost of setting up and running the tax system is considered, we might be no better off than with no tax at all. We would have failed to apply social-cost pricing to all transportation options. Even if we were able to apply exact marginal-cost prices to, say, gasoline use, we still could have perverse outcomes if we don’t apply MSC pricing to all transportation options. Turn again to the example in the sidebar, but suppose now that the personal time cost of the bus trip is $9 instead of $8. Without MSC pricing, the traveler will choose the $9.50 car trip over the $10 bus trip. This is the best choice for society, because the $10.50 MSC of the car trip is less than the $12 MSC of the bus trip. However, if we apply MSC pricing to motor-vehicle use but not bus use, then the traveler will choose the bus (still $10 private cost but $12 social cost) over the car (now $10.50 private and social cost, including the $1.00 externality charge), and society will be worse off than with no MSC pricing at all. I emphasize that these are problems not with the ideal theory of MSC pricing, but rather with any imperfect application (including, for example, charges per vehicle mile of travel), especially to environmental externalities such as air pollution. Although it is possible, in principle, to analyze these issues carefully and lessen problems, such “second-best” analyses are as complicated and uncertain as analyses of external costs. One might reasonably be skeptical of building policy on such compounded uncertainty. Some people advocate “getting the prices right” in the belief that it will encourage the use of public transit or new transportation technologies, such as electric vehicles. But if the “right” prices are supposed to be efficient prices, then, as mentioned above, all transportation modes must be priced at MSC. As we shall see, the subsidies to public transit generally are much greater than the external costs of automobile use, per passenger mile; as a result, MSC pricing generally would favor auto use over transit use. Similarly, MSC pricing probably would favor conventional gasoline vehicles over new vehicle technologies. 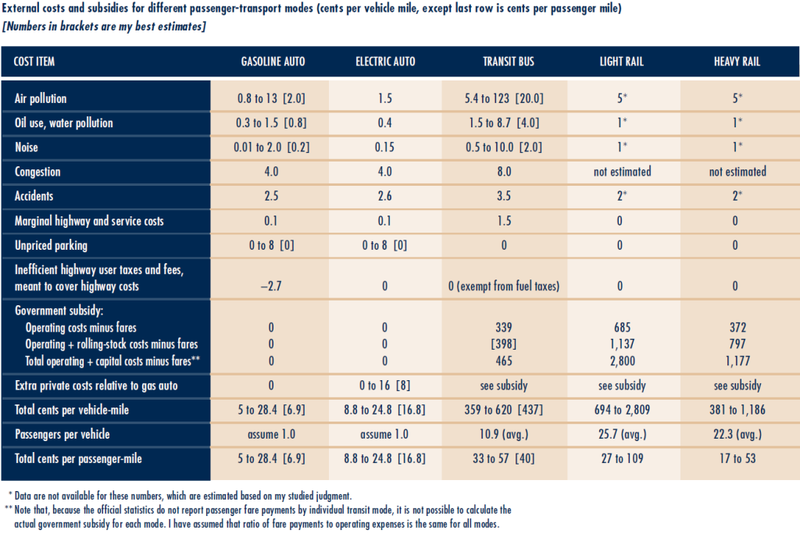 The table below compares external costs and subsidies of gasoline passenger vehicles with those of electric vehicles, buses, and trains. Each entry in the table is the estimated cost of the externality created by use of a particular transportation mode, expressed as cents per mile. I show what I think is the most likely value, and, in some cases, a range indicative of the uncertainty discussed above. The estimates are derived from my work on the social cost of motor-vehicle use, analyses by the Federal Highway Administration of the appropriate allocation of social costs to different modes, and reported capital and operating costs and fare revenues of transit operators. The first row of the table estimates the air pollution externality (health, physical damage, etc.). For gasoline-powered autos, the most likely cost is 2 cents per vehicle mile, and the range of possible estimates goes from 0.8 to 13 cents per mile. Electric autos are nearly as high, 1.5 cents per vehicle mile, because of emissions from power plants. The externality from transit buses is 20 cents per vehicle mile—ten times higher than the air pollution externality of autos, so a bus must carry ten times more passengers, averaged over the day, to have a lower air pollution cost per passenger-mile. The “Government Subsidy” row gives three estimates for each public transit mode, depending on the three possible definitions of cost. For electric and gasoline vehicles, I compare private ownership and operating costs and relevant external costs for advanced technology vehicles in high-volume production. We see that a gasoline vehicle does indeed generate greater external costs, but this difference is smaller than the difference in private costs of ownership and operation. 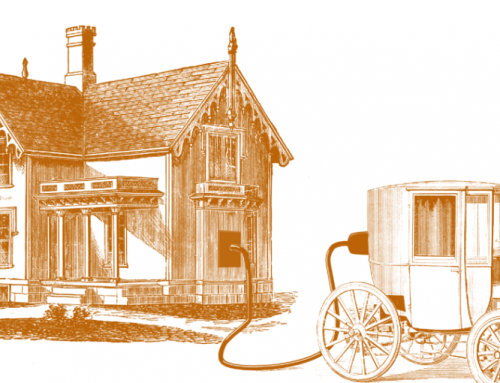 The private cost per mile of a technologically mature electric vehicle (EV) will be greater than that of a clean and efficient modern gasoline car. As a result, it’s unlikely that MSC pricing would induce many people to buy and use EVs instead of gasoline vehicles. Other researchers have reached broadly similar conclusions regarding EVs and other alternative-fuel vehicles. The comparison of auto with public-transit use is dominated by the enormous direct government subsidies to buses and trains. These subsidies are the differences between the cost and the fares received from users. In official transit statistics, the subsidy is estimated against operating costs only. In these official statistics, the operating subsidy alone is about $1.40 per passenger, or nearly 30 cents per passenger mile, averaged over all transit modes. However, one can argue that an efficient price for transit would cover some or all of the capital costs. (Unsubsidized providers of transit, such as taxi and van companies, presumably price to cover capital costs). In the table, I show the subsidy estimated with respect to operating costs, operating costs plus the cost of rolling stock, and operating costs plus all capital costs. On the auto side of the ledger, there is some question as to whether “free” parking is a subsidy. I believe it is not, at least not entirely, because in perfect markets some (and perhaps most) parking would remain unpriced. Nevertheless, I have shown a high-end estimate that counts the cost of all unpriced parking as a subsidy. It turns out, though, that it really doesn’t matter how one does the accounting. In virtually every case, the total subsidy to transit greatly exceeds the total subsidy to auto use, per passenger mile, in both absolute terms and relative to the prices users currently pay. Thus, the elimination of subsidies in accordance with a plan for MSC pricing (and optimal investment) would, on average, reduce, not increase, the use of public transit. Some advocates of MSC pricing might reply: “So be it. If that’s all that MSC pricing accomplishes, then that’s all that should be accomplished.” But most folks do not believe that social cost-benefit analysis reflects everything that society cares about, or that all problems can or should be addressed by pricing. Many analysts believe that the present state of practice in cost-benefit analysis does not satisfactorily accommodate social concerns about distributive fairness, equal opportunity, uncertainty and risk, ecological stability, future generations, quality of life, and so on. They believe that these concerns still need to be worked out in messy political processes, not subordinated to or eviscerated in analyses of efficient pricing. To allow for these concerns, we must continue to use and develop politically open policies that are informed, but not determined, by technical economic analyses. It is unarguable that emission standards on automobiles have greatly reduced air pollution and measurably improved urban air quality. And it is inconceivable that, had we started with emission taxes rather than standards almost thirty years ago, we would have ended up with the near-zero-emission vehicles that we have today. What is arguable is whether any particularly stringent standard or technology mandate (such as the zero-emission vehicle mandate of the California Air Resources Board) is in some sense “worth it.” Social-cost/benefit analysis can and should inform—but not decide—these arguments. 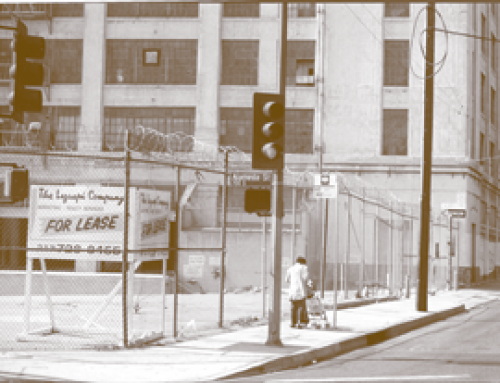 Economic tools in a broader social context. The best way to get people to buy and use inherently clean alternative transportation technologies, such as fuel-cell electric vehicles, is to make them attractive on the basis of private cost. This requires aggressive long-term research and development to improve performance and lower sales prices. There are good arguments that fuel-economy standards, not fuel prices, caused the development of more fuel-efficient vehicles, and that the standards, moreover, did not have pernicious side effects. Of course, this does not mean that fuel-economy standards should be raised indefinitely (or even at all), or that standards should be set without regard to costs. The point, once again, is that social-cost/benefit analysis should inform, but not decide, energy policy. Focused transit and land-use planning. Although transit and land-use policies may never have a significant effect on total urban pollution, congestion, energy use, or accidents, they can focus successfully on certain problems. For example, a small auto-free zone in a city center will have essentially no effect on global climate, but it may make the city center a decidedly nicer place. Similarly, innovative urban transit programs for the poor will not affect oil imports, but they can be important components of programs for the urban underclass. These require innovative transit and land-use policies focused on improving the quality and reducing the cost of alternatives to private automobile use—not MSC pricing. Admittedly, all these tools have serious shortcomings: they can restrict producers too much, coerce consumers too much, inappropriately exclude important effects, be too unfocused (or too constrained) to be productive, too liable to political manipulation, and so on. Moreover, MSC pricing and these other tools are not, in principle, mutually exclusive. Indeed, as I emphasized at the outset, if we can estimate and implement MSC pricing intelligently, without abandoning or subordinating tools that address transportation problems more broadly and directly, then perhaps we ought to “get the prices right.” After all, the theory is appealing, and already some applications (such as road pricing to reduce congestion) are becoming technically and even politically feasible. For those who believe that our main objective should be to improve economic efficiency—to maximize net social benefits of transportation—and that we are equipped analytically to attain that objective, MSC pricing may be the logical approach. But one can conclude that MSC might not be feasible and that economic efficiency, even broadly defined to incorporate external costs, is just one of several social goals. Then the appropriate policy is to conduct systematic social-cost/benefit analysis, along with other forms of analysis and argument, to inform open political decision-making processes. Even though we should we be wary of embracing MSC pricing unreservedly, we still should employ social-cost analysis to understand the relative importance of transportation problems, illuminate tradeoffs, and evaluate transportation alternatives. For example, even if we have no intention of pricing every gram of particulate matter according to its size, composition, and time and place of emission, it still may be helpful to know whether particulate emissions are more costly than emissions of ozone precursors, or how much particulate emissions from diesel vehicles must be reduced to retain the benefits of higher fuel economy. It may help us set standards, invest in new vehicle technology, plan cities, and so on. Of course we care about more than just economic efficiency; and, because MSC pricing as the primary means of achieving efficiency is difficult to implement and has limited and uncertain benefits, we ought to think twice before applying MSC pricing to transportation. Rather than address most transportation problems by MSC pricing, we should use the analyses that underlie it to inform political debate. Political decision making may be clumsy, messy, irrational, and aggravating, but it surely will be more inclusive, more nuanced, and more equitable than the best social-cost/benefit analysis. 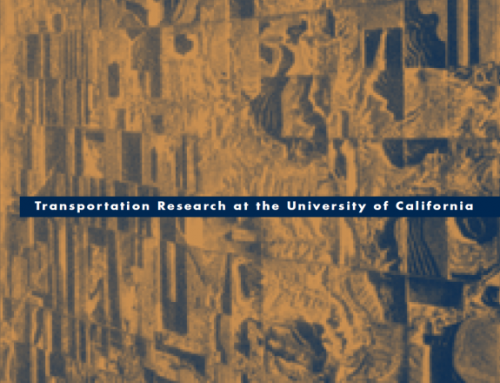 Mark A. Delucchi, The Annualized Social Cost of Motor-Vehicle Use, 1990-1991: Summary of Theory, Methods, Data, and Results (University of California, Davis: Institute of Transportation Studies, 1997). UCD-ITS-RR-96-3 (1). Robert A. Johnston and Caroline J. Rodier, “Synergisms Among Land Use, Transit, and Travel Pricing Policies,” Transportation Research Record, forthcoming (2000). A. Scheffer Lang, “A New Transportation Paradigm,” Transportation Quarterly, v. 53, no. 4, pp. 14–22, 1999. Susan Owens, “From ‘Predict and Provide’ to ‘Predict and Prevent’? : Pricing and Planning in Transport Policy,” Transport Policy, v. 2, pp. 43–49, 1995. Kenneth A. Small, “Economics and Urban Transportation Policy in the United States,” Regional Science and Urban Economics, v. 27, pp. 671–691, 1997.